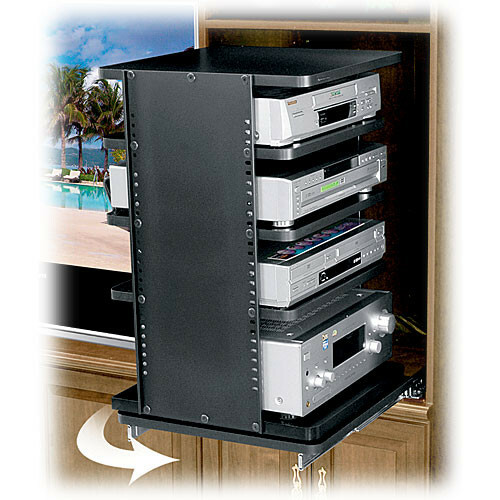 The ASR-30 Slide-Out & Rotating Shelving System from Middle Atlantic is a slide-out and rotating shelving system designed for use with home-entertainment applications. Gain full access to all of your equipment without removing it from the rack by using this unique and practical system. Once pulled out, the rack can be rotated 60° in either direction. This system is ideal for entertainment systems housed in custom cabinetry and millwork, among other similar setups. This model is 30" high and includes (4) easy index self-leveling shelves. It will support up to 150 lbs of equipment. Box Dimensions (LxWxH) 38.5 x 20.5 x 5.0"